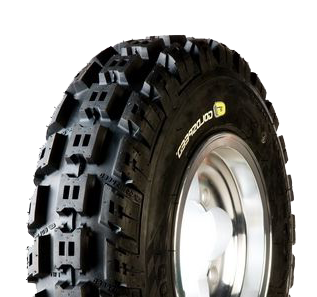 The Goldspeed MXF front ATV tyre features a revised profile with an excellent contact patch providing excellent predictability and performance on the track. Based on the R&D development with factory European & USA racing teams the advanced tread design & high-tech duel rubber formulation of this tyre has proven its self every time! The MXF features a 4 ply rated carcass with a utilizing sidewall apex design that stiffens the sidewall during side load without a sacrifice in performance loss creating an excellent balanced ride. The special Goldspeed rubber compounds give the operator a unique advantage over the competition with unmatched rubber compounds to fit each track & track condition. The MXF tread design delivers an excellent contact patch for extreme grip/traction on hard/med terrain surface.